Happy New Year! I want to get up-to-date and share all the pies and tarts that friends and I made this holiday season, but before I do, I wanted to do a little 2011 "State of Nothing-in-the-House Address"/year end wrap up because it was a great year--perhaps the best ever-- for the pie blog, pie baking and other pie-related endeavors! First off, this year we had the greatest number of posts yet--85! We also had the most blog hits in 2011, with 3,280 page views in November. Thanks to all those readers, new and old out there. In 2012 I'd like to aim for 100 posts, and for even more readers...and commenters! I love when people give feedback, personal connection to or historical context of a pie, etc. Keep 'em coming. In March we hosted our 2nd annual Pi(e) Day on the Piedmont, at Johnny's in Carrboro, NC. 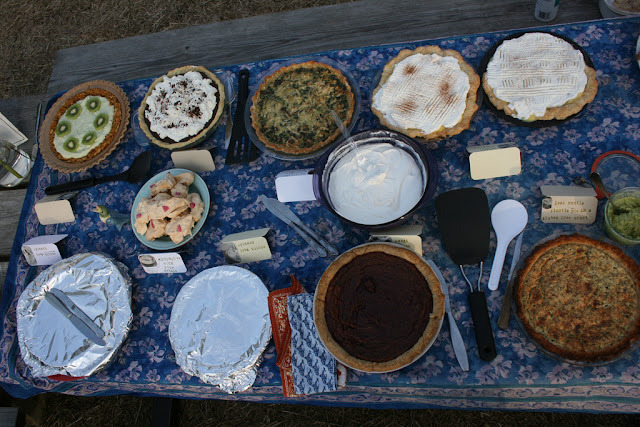 We had a spread of 24 different pies and some hand and mini pies made by our awesome Pi(e) Day baking team, raised $400 for CEFS to develop a statewide youth food council, and celebrated pie, spring, and math with about 75 attendees. I've enjoyed revisiting Ashley's video about it here-- maybe you will too. I was very excited to have the opportunity to do some pie-related writing in an outside publication last year. 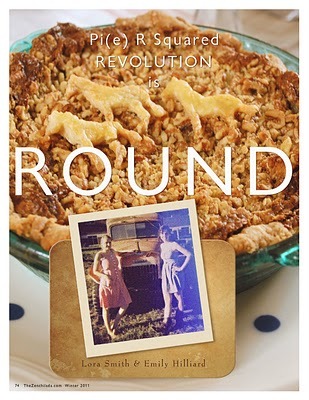 My friend Lora and I wrote this piece Pi(e) R Squared Revolution is Round, using pie as a lens to discuss our ideas of female friendship, tradition, and the domestic arts, for the awesome online food magazine Zenchilada. You can read our article here and see our featured recipes here. I was also asked by author of Pie Contest in a Box Gina Hyams, to do an interview with her for her blog, Pie Takes the Cake. I was so honored to be asked, and excited to see it come out so well. You can read the full transcript here. I'm looking to find more opportunities to do some off-blog pie and food writing in 2012, and would like to feature more of my own interviews with fellow bakers, pie shop owners, and authors. Check back here for one with Natalie of Bike Basket Pies coming soon in the new year. And lastly, this year we launched the Nothing-in-the-House Facebook and Twitter (@housepie) pages, adding 2 more ways to bring pie recipes, history, and ephemera into your life. Please follow and like us if you haven't already, and tell your friends! On ward and upward to Nothing-in-the-House 2012, with more pie baking experiments and musings on pie history, paraphernalia, and cultural import. How bout Bedfordshire clangers? An audio piece about a visit to Pie Lab? Maybe we can even get co-founder Margaret to start contributing again? Here's to this being the best year yet--may your pies be tasty, your butter be cold, and your PEZ (Pie Enjoyment Zone) be frequently visited and full of friends. :) I love the pie blog.